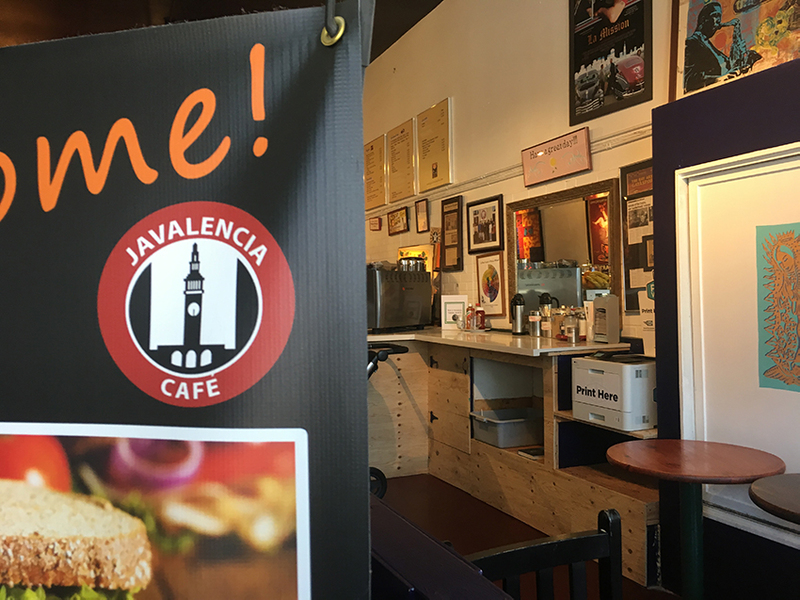 Javalencia Cafe sign and PrintWithMe setup in the background at the location on Valencia and 20th Streets. Photo by Mallory Newman. If you’ve recently felt the need to print out a document in a pinch — and you’re among the growing swath of the population that had a printer in your home 10 years ago and no longer do — you have probably experienced the frustration of dashing to the nearest printing station. You’d have to find one first. But what if you just had to walk to the nearest cafe? Enter PrintWithMe. 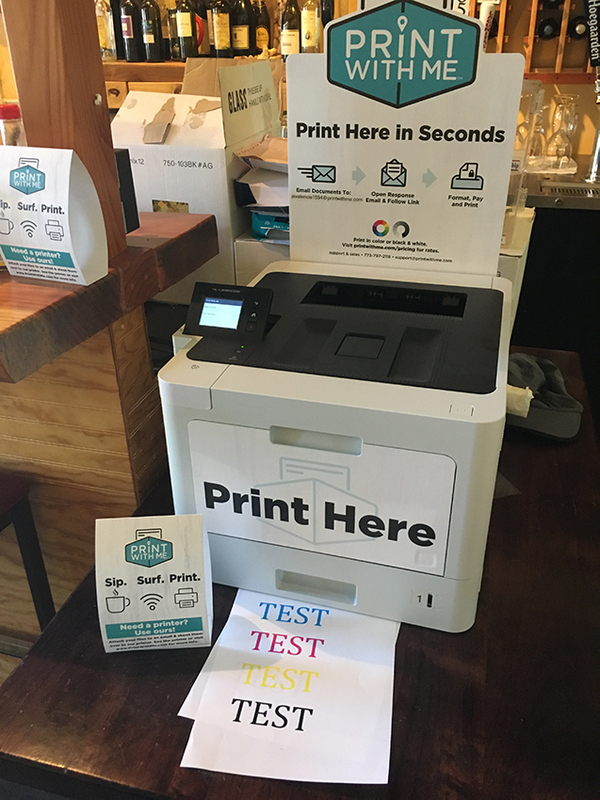 Mobile printing stations installed by this Chicago-based startup are popping up in local coffee shops, and are part of the trend away from home printers. Like so many innovations, this endeavor is being piloted in the Mission. And, like so many innovative tech companies moving into the Mission, it’s prompting the ongoing existential question of how much cool new tech this neighborhood can take. For now, PrintWithMe — whose motto is “Mobile printing. Simplified” — has landed in San Francisco via Javalencia Cafe with a location on Valencia Street and on Market Street in Hayes Valley. The longtime local businessman Servio Gomez owns the cafes, along with a picture-framing store, Back to the Picture, next door to the Mission location. He said he is about to open a pizzeria next to the Hayes Valley cafe. He says he’s run businesses in the Mission for 33 years and the local cafe for 18 years. At Coffee Fest in Portland last year, Gomez says he met with the founders of PrintWithMe and decided to give them a shot. “I found this guy and his company — it’s a brilliant idea. They bring it, they service it, everything. I just give them the space,” says Gomez. To local shop owners, the PrintWithMe service is marketed as being low-burden. Everything is posted on the printer including a customer support number. Ink and paper levels are monitored centrally and topped off by local contractors. And it’s fairly user-friendly, even for those of us who aren’t particularly tech-savvy. You email a document or attachment to the address on the printer, open the email it sends back to you, and click the button to start. It opens a new web browser where you can pick settings, input payment information, and confirm the print job. You’ll get a code to enter into the touchpad on the printer and out come your pages, all in under five minutes, ideally while you wait for your coffee. But — not for free. Currently, PrintWithMe is priced at 99 cents for the first black-and-white page and $1.19 for the first color page. Print two to five pages, and the rate drops 40 percent to 39 cents per page for black-and-white and 89 cents for color. 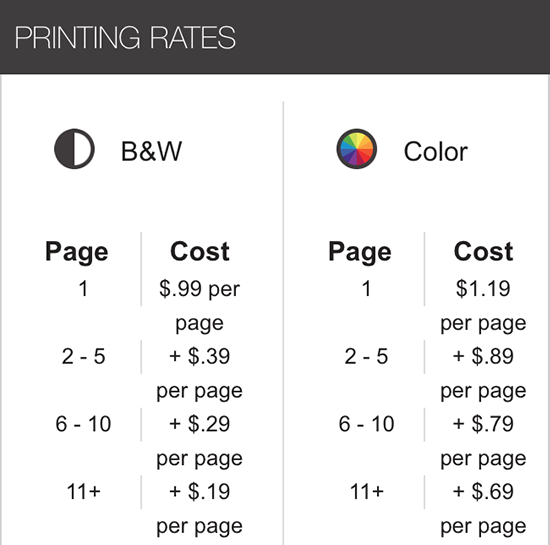 Once you get up to 11 pages, the rate drops to a competitive 19 cents for black and white and 69 cents for color. Screenshot of printing rates presented while making printing selections. Courtesy PrintWithMe. This is a bit more than you’d pay at FedEx Office or Office Depot, which, respectively, charge about 16 cents for black and white and 75 cents for color, and 15 cents for black and white and 71 cents for color, with the rate only dropping if you print 100 pages or more. Local libraries charge 10 cents per page for black and white and 40 cents per page for color. Company CEO Jonathan Treble, formerly of GrubHub, says the price difference is because credit card companies charge PrintWithMe a high rate of 25 percent of the total cost; larger, more established companies like FedEx have negotiated lower rates that they are able to pass on to consumers. Treble would like to get to that level soon by opening more locations, but for now is banking on convenience being enough of a selling point to offset the higher initial cost. He added that, since market prices are different in every community, they’re “looking into” how those prices can be adjusted for the neighborhood. Treble came up with the idea after hunting around his own town looking for somewhere to print out concert tickets. “When people want to print near home, but there’s not a FedEx nearby and the library’s not easy, why not put [printers] in public spaces where people can print often and frequent often?” Treble says. His startup is looking to expand outside of these several pilot stations in the Mission and dive further into the San Francisco market in the fall. At present, it has around a dozen printing stations in the greater Bay Area, mostly in coffee shops. Local spots include Berkeley, Richmond and San Jose, with more than 500 stations in major cities nationwide — and not just coffee shops but also hotels, co-working spaces, and multi-family residences. Gomez at Javalencia seems content with that. “To me, it’s better for the service of the customers. A lot of students use it. They just look for ‘printer near me’ on Google,” he says. The SEO boost doesn’t hurt either. That’s a homey touch. Less homey is that the company’s sales team employs an algorithm to choose potential PrintWithMe sites that takes into account the nearest FedEx or Office Depot location, the potential host’s Yelp rankings, how long they’ve been established, and general vibe in the neighborhood. (Yes, the algorithm includes the vibe). “Our focus is on students near universities, coworking spaces, and freelancers,” Yeoh says. In other words, welcome to the Mission. PrintWithMe kit in Javalencia Cafe on at 920 Valencia St. Photo by Mallory Newman. While the company presents itself as a useful tool for the community, some aren’t so sure of its helpfulness. Melissa Daniels, general manager at Coffee Mission on the corner of 24th and Osage, next to the BART station, used to have a PrintWithMe station. She quickly opted out. “It was more hassle than it was worth,” Daniels said about having it removed more than a month ago. Daniels recalled going in circles with customer support for weeks when the printer stopped working. When it was ostensibly up and running, she said it often malfunctioned or wasn’t quick enough for customers. Often, she would just have them email her their documents to her own personal account, and print them out in the back office. She wondered why people didn’t just go to the Mission branch library to print, since it’s a block away. At that library on 24th and Bartlett Streets, visitors can print black-and-white or color copies for considerably less. But what you save in money you may spend in time. You’ve got to purchase a print card and follow a sheet of instructions that seems to exasperate even the clerks. The library uses a similar service by PrintOn, which has printers in more than 40 locations across San Francisco. Many are located in public institutions like City Hall and the airport. PrintOn has more than 9,000 public locations globally. Javalencia’s Gomez was surprised to learn that he’s a trailblazer. He didn’t realize he’s the only merchant currently using the PrintWithMe service in San Francisco, and is optimistic about the partnership with the mobile printing company.